As we reported yesterday, President Trump had decided to withdraw from the job-killing Paris accord. Today he made that withdrawal official. The President’s action kept his campaign promise to pull out of the deal and his promise to put American workers first. Like every deal Obama and Kerry put their hands on, this one was negotiated poorly signed out of desperation. It front-loads costs on the American people to the detriment of our economy and job growth while extracting meaningless commitments from the world’s top global emitters, like China. The U.S. is already leading the world in energy production and doesn’t need a bad deal that will harm American workers. The deal puts America in an inferior competitive positions hurting the economy and jobs; According to a study by NERA Consulting, meeting the Obama Administration’s requirements in the Paris Accord would cost the U.S. economy nearly $3 trillion over the next several decades. As the President explained India “makes its participation contingent on receiving billions and billions and billions and billions of dollars in foreign aid… China will be allowed to build hundreds of additional coal mines, India will be allowed to double its coal production; we’re supposed to get rid of ours”. The accord hurts a growing segment of the U.S. economy, According to the Energy Information Administration (EIA), the U.S. is the leader in oil & gas production. The agreement funds a UN Climate Slush Fund underwritten by American taxpayer. President Obama committed $3 billion to the Green Climate Fund – which is about 30 percent of the initial funding – without authorization from Congress. With $20 trillion in debt, the U.S. taxpayers should not be paying to subsidize other countries’ energy needs, especially when those countries are U.S. competitors. 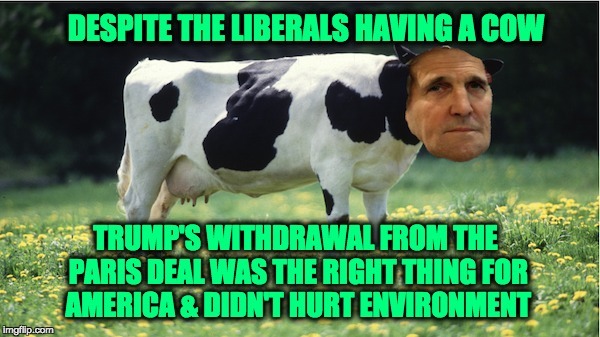 Despite the fact that Liberals are having a major cow, President Trump made the best decision for America by pulling out of a deal that didn’t help with the environment. It was simply an attempt of redistributing income from the United States to undeveloped countries. Full transcript as posted by the White House. I would like to begin by addressing the terrorist attack in Manila. We’re closely monitoring the situation. And I will continue to give updates if anything happens during this period of time, but it is really very sad as to what’s going on throughout the world with terror. Our thoughts and our prayers are with all of those affected. Before we discuss the Paris accord, I’d like to begin with an update on our tremendous, absolutely tremendous economic progress since election day on November 8th. The economy is starting to come back and very, very rapidly. We’ve added $3.3 trillion in stock market value to our economy, and more than a million private sector jobs. So we’re getting out, but we will start to negotiate, and we will see if we can make a deal that’s fair. And if we can, that’s great. And if we can’t, that’s fine. As president, I can put no other consideration before the wellbeing of American citizens. The Paris climate accord is simply the latest example of Washington entering into an agreement that disadvantages the United States, to the exclusive benefit of other countries, leaving American workers, who I love, and taxpayers to absorb the cost in terms of lost jobs, lower wages, shuttered factories and vastly diminished economic production.